On this page, you will find many excerpts of contemporary clarinet music and we will be going over some of the techniques that the various pieces use. I will also be doing full reports on these pieces to help you understand the nature of these pieces. The first piece is entitled "A Cartoon," and its instrumentation is or B-flat clarinet and piano. In the first 10 bars or so, we see that there is imitation between the clarinet and piano. We also see that the character in the clarinet swings back and forth between sustained and short (i.e. the alternating tenuto and staccato markings). 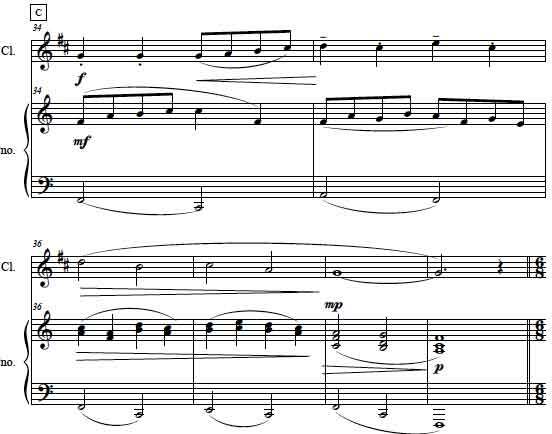 At the end of the first 30 or so measures, we see the clarinet playing longer sustained notes (half notes) indicating the end of a set of phrases that I would call the opening phrases or first theme of the piece. 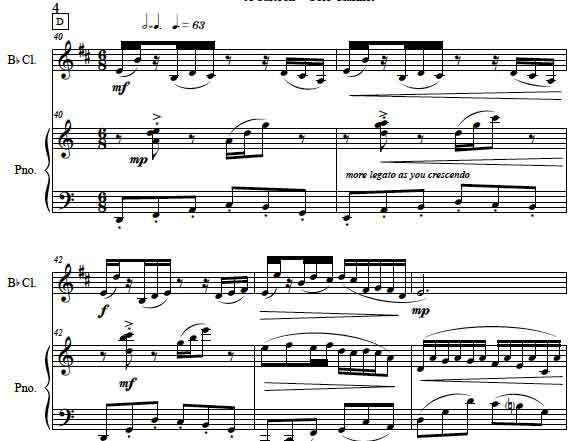 The next few pages prompt a time change to 6/8 and a medium tempo piano part and a riff reminiscent of "Scarborough Fair" (at least in terms of contour and shape). Trills, staccatos and tenutos give the character of the piece a wild reading. The piano takes on a heavy, almost rock n roll type gesture in the middle of this theme. A spiral downward in the piano combined with that high trill in the clarinet takes us back to the first theme of this piece of clarinet music. At a faster pace, the first theme starts out on the lydian scale in which it began and then culminates in the piano and clarinet trading off in a clownish frenzy toward the clarinet and piano's resounding high and low concert F's (G's in the Clarinet). If unsure how to play this kind of clarinet music, watch and listen to the video below and you'll hear how the clarinet clearly articulates each character marking and phrase. This piece of clarinet music (for B-flat Clarinet and Piano) is a wild and clownish take on rhythm and melody that resembles (almost) the soundtrack of a cartoon, hence the title, "A Cartoon." Printable on 8.5 x 11 paper straight from your computer. It is intermediately difficult. Perfect for intimate concert settings. This is a single part for B-flat Clarinet only on the left and for full score on the right. 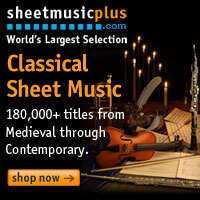 Go to the following link if you want music other than clarinet music.